Collects and handles line tables information in a CodeView format. Definition at line 51 of file CodeViewDebug.h. 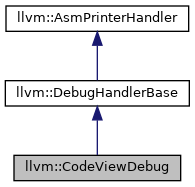 Definition at line 110 of file CodeViewDebug.cpp. References llvm::MCContext::allocate(), llvm::DebugHandlerBase::Asm, assert(), llvm::StringRef::back(), llvm::DIFile::CSK_MD5, llvm::DIFile::CSK_SHA1, llvm::MCStreamer::EmitCVFileDirective(), llvm::MCStreamer::EmitCVInlineSiteIdDirective(), F(), File, llvm::fromHex(), llvm::MCObjectFileInfo::getCOFFDebugSymbolsSection(), llvm::MCStreamer::getContext(), llvm::DIScope::getDirectory(), llvm::DIScope::getFilename(), llvm::MachineModuleInfo::getModule(), llvm::Module::getModuleFlag(), llvm::Module::getNamedMetadata(), llvm::AsmPrinter::getObjFileLowering(), llvm::Module::getTargetTriple(), llvm::sys::path::is_absolute(), llvm::ConstantInt::isZero(), mapArchToCVCPUType(), llvm::DebugHandlerBase::MMI, llvm::None, llvm::sys::path::posix, replace(), llvm::MachineModuleInfo::setDebugInfoAvailability(), llvm::StringRef::startswith(), and Success. Definition at line 1292 of file CodeViewDebug.cpp. References llvm::DebugHandlerBase::Asm, assert(), llvm::classifyEHPersonality(), llvm::MachineFunction::exposesReturnsTwice(), FramePtr, llvm::MachineInstr::FrameSetup, llvm::MachineFrameInfo::getCVBytesOfCalleeSavedRegisters(), llvm::DebugLoc::getFnDebugLoc(), llvm::MachineFunction::getFrameInfo(), llvm::TargetSubtargetInfo::getFrameLowering(), llvm::MachineFunction::getFunction(), llvm::AsmPrinter::getFunctionBegin(), llvm::MachineFrameInfo::getOffsetAdjustment(), llvm::TargetMachine::getOptLevel(), llvm::Function::getPersonalityFn(), llvm::TargetSubtargetInfo::getRegisterInfo(), llvm::MachineFrameInfo::getStackSize(), llvm::MachineFunction::getSubtarget(), llvm::Function::hasFnAttribute(), llvm::TargetFrameLowering::hasFP(), llvm::MachineFunction::hasInlineAsm(), llvm::Function::hasOptNone(), llvm::Function::hasOptSize(), llvm::Function::hasPersonalityFn(), llvm::MachineFrameInfo::hasStackProtectorIndex(), llvm::MachineFrameInfo::hasVarSizedObjects(), llvm::isAsynchronousEHPersonality(), MI, llvm::TargetRegisterInfo::needsStackRealignment(), llvm::None, llvm::CodeGenOpt::None, llvm::DebugHandlerBase::PrologEndLoc, llvm::AsmPrinter::TM, and TRI. Definition at line 2834 of file CodeViewDebug.cpp. References llvm::DebugHandlerBase::Asm, llvm::DebugHandlerBase::beginInstruction(), llvm::MCContext::createTempSymbol(), llvm::MachineInstr::FrameSetup, llvm::MachineModuleInfo::getContext(), llvm::MachineInstr::getDebugLoc(), llvm::MachineInstr::getFlag(), llvm::MachineInstr::getParent(), llvm::MachineInstr::isDebugInstr(), llvm::AsmPrinter::MF, llvm::DebugHandlerBase::MMI, and llvm::DebugHandlerBase::PrevInstBB. Definition at line 2799 of file CodeViewDebug.cpp. References llvm::DebugHandlerBase::Asm, assert(), llvm::MachineFunction::getCodeViewAnnotations(), llvm::MachineFunction::getCodeViewHeapAllocSites(), llvm::LexicalScopes::getCurrentFunctionScope(), llvm::MachineFunction::getFunction(), llvm::AsmPrinter::getFunctionEnd(), llvm::Function::getSubprogram(), and llvm::DebugHandlerBase::LScopes. Emit the COFF section that holds the line table information. Definition at line 517 of file CodeViewDebug.cpp. 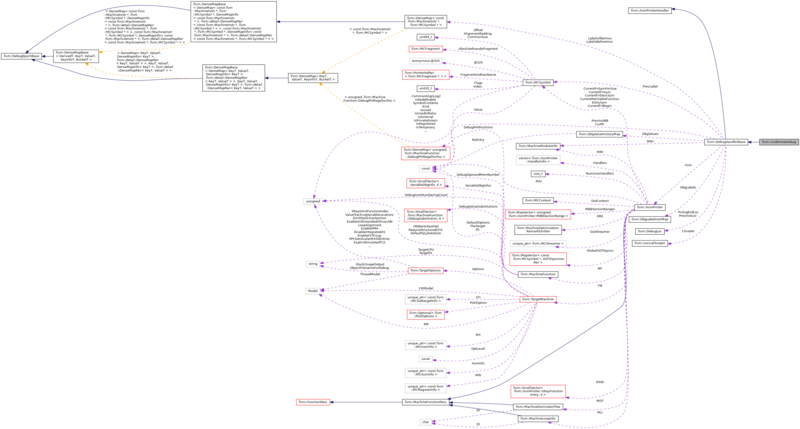 References llvm::DebugHandlerBase::Asm, assert(), llvm::MachineModuleInfo::hasDebugInfo(), llvm::DebugHandlerBase::MMI, and P.
common symbols), this tracks that size. Definition at line 457 of file CodeViewDebug.h.